Here’s a fabulous alternative to battered and deep-fried shrimp. 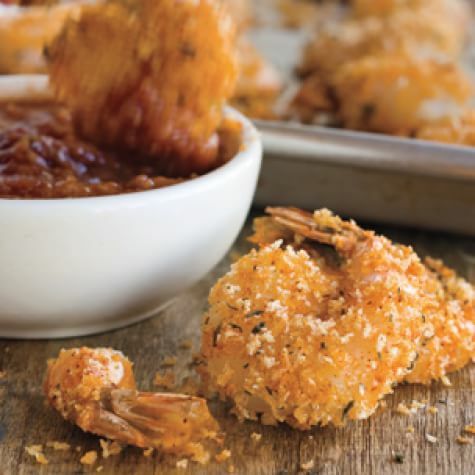 Coating the shrimp with bread or rice crumbs, spritzing with cooking spray and then baking give this appetizer a wonderful crunch without all the saturated fat and calories of deep-frying. 1. Place bread crumbs in a shallow bowl. In another shallow bowl, combine egg whites and milk. In a third shallow bowl, combine flour, seafood seasoning, salt and pepper. Dip shrimp in the flour mixture, egg mixture, then bread crumbs. 2. Place shrimp on an oiled baking sheet coated; spritz shrimp with olive oil. Bake at 400° for 8-12 minutes or until shrimp turn pink and coating is golden brown, turning once.